NASA announced the formal start of the Wide Field Infrared Survey Telescope (WFIRST) mission on February 18. Planned as the agency's next major astrophysics observatory following the launch of the James Webb Space Telescope, WFIRST will survey large regions of the sky in near-infrared light to answer fundamental questions about the structure and evolution of the universe and to expand our knowledge of planetary systems around other stars. "There will be a huge amount of data from the surveys, and part of our job is to think about how we can make that data most useful for general astronomers in order to optimize the science payoffs," Robertson said. "We are also helping to evaluate the design of the telescope, running simulations of how it will work and analyzing simulated images." 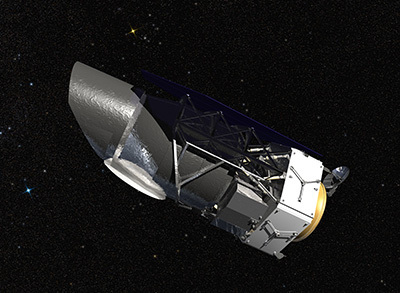 WFIRST incorporates components from an existing telescope NASA acquired from another agency in 2012, including a 2.4-meter mirror of identical size and quality to the one used by the Hubble Space Telescope. The telescope's Wide Field Instrument will give it the ability to capture a single image with the depth and quality of Hubble but covering 100 times Hubble's field of view. WFIRST will also carry a Coronagraph Instrument designed to block the glare of individual stars and reveal the faint light of planets orbiting around them. "The design work is already well advanced, and it is a really impressive telescope," Robertson said. "Its camera is about 200 times larger than Hubble's, and this capability will enable astronomers around the world to use WFIRST to explore the deepest reaches of space over an area thousands of times larger than the size of the moon on the sky." In addition to surveys of deep space beyond our galaxy, WFIRST's sensitivity and wide field of view will enable a large-scale search for exoplanets by monitoring the brightness of millions of stars in the crowded central region of our galaxy. The survey will net thousands of new exoplanets, complementing the work started by NASA's Kepler mission and the upcoming work of the Transiting Exoplanet Survey Satellite. "In addition to its exciting capabilities for dark energy and exoplanets, WFIRST will provide a treasure trove of exquisite data for all astronomers," said Neil Gehrels, the WFIRST Project Scientist at NASA's Goddard Space Flight Center in Greenbelt, Maryland. "This mission will survey the universe to find the most interesting objects out there." The James Webb Space Telescope (JWST), planned to launch in 2018, will see deeper into space and further back in time than WFIRST. With its larger mirror, JWST will be able to observe much fainter galaxies, but its field of view is much smaller. "JWST will conduct very deep observations of a small area, while WFIRST will cover large areas at the same depth as Hubble," Robertson said. "If they overlap and JWST is still operational when WFIRST launches, it will be a very powerful combination."